This moth is a serious pest of many stored food products worldwide. It may be the most common food-infesting moth in homes, stores, and warehouses. I’m in Colorado. I recently noticed some small moths fluttering around. I didn’t think much of it, as we always have moths. Then the other day, I went to feed Charlie, our hamster, and I noticed one of these moths in his food. Then, when I went to poor some out, I realized there was a ‘webbing’ over some of the food. Odd, I thought. Mold? Maybe it had gotten wet. Then, after closer inspection, I found little worms crawling in it. Ewwww! I am such a neat freak, and this, had me feeling, well, icky! Sure enough, I looked in the container, and there was a little moth, flitting around. I ended up throwing away one new bag, and several partial bags of rice. I knew what these little pesky moths were. We used to have them in Florida. Pantry Moths. Pantry moths can either be Indian meal moths, or Mediterranean flour moths. Both are considered “Pantry Moths”. These moths often come into the house in rice, dry pet food, and other grains from the store. Yep, the food you bring home is the likely culprit of this pest! If you find them in your food stuffs, it’s not because you’re ‘dirty’, or need to clean your house. Dry pet food, nuts and seeds, dried fruit and coarse grains are favorites of this moth. 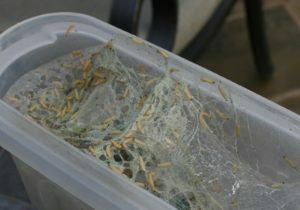 Infestations of stored foodstuffs are characterized by surface webbing produced by the larvae. As I said, most moth-infested cabinets are a result of infested food that has been brought in from the outside. All it takes is one female to enter the house in your grocery bag, and you may face an influx. Once she is there, she has the potential to lay over several hundred eggs. A caterpillar worm-like moth larvae that may be a 1/2 inch long and contains about 5 pair of legs. 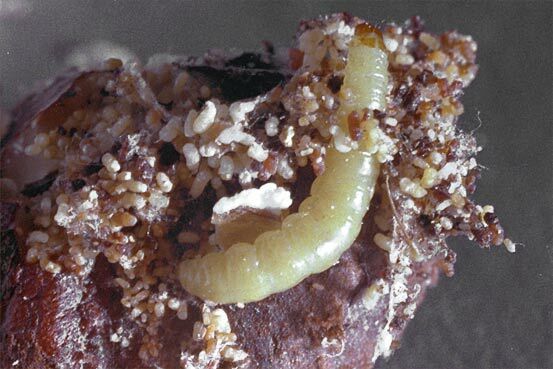 Many times larvae will be mistaken for weevil grubs, but Pantry Moth Larvae have an off white color. An adult moth is roughly half an inch, and is 5/8 of an inch with wings extended. Adult moths will only live 1 or 2 weeks because they don’t feed as adults. Usually, if recently purchased food is infested, it will contain pests in the egg stage which you can’t see. The eggs will then hatch, feed and pupate, and infest the other food in your cabinet. 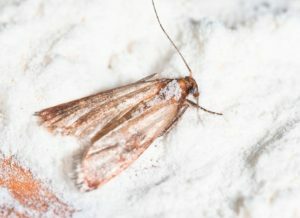 Products including flour, whole grains, crackers, peas, beans, nuts, dried fruit, spices, and even pet food need to be checked for moth presence. Look for telltale signs of moths: small holes in the packaging and webbing in the tighter areas of the package. 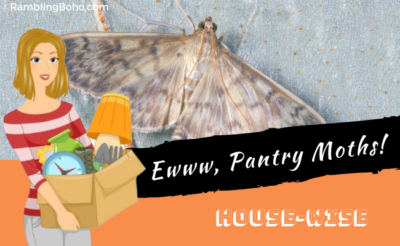 Pantry moth webbing can be found everywhere from the edge of canned goods, to the underside of a screw on lid on peanut butter. If the food stuff is toward the back of the cupboard, the odds of infestation are higher, because it is dark and relatively undisturbed. According to sources, most of the time stored product pests can be dealt with by paying attention to how packages are sealed and stored. Use heavy plastic or glass containers. Store all of your food in tightly sealed containers. Glass jars with lids that have rubber gaskets are an excellent choice. Beware that even jars with screw tops may not be sufficient against pantry pest invasion. This keeps the moths from infesting your other foods if you happen to bring home something infested from the grocery store. The moths are able to get into surprisingly tight spots, including sealed bags and Tupperware containers. Most importantly, don’t store susceptible foodstuff longer than about two months unless you freeze it first. It takes 4 days in the freezer to kill these critters. Many people just freeze the infested food instead of throwing it away. After freezing it, if it is pasta or rice, rinse it a couple times before boiling. The eggs and larvae aren’t harmful if you eat them. but you may feel it’s just to disgusting to eat…bugs.